I try to reshuffle the contents of my makeup bag every now and again, so I thought I'd share some new additions that I've been loving lately. I featured this in my favourites last month and I'm still loving it. It's the perfect everyday shade of pink and the formula is completely non-sticky and weightless on. I finally caved and begged a friend to bring me one of these back on her recent trip to New York. The hype is totally justified - if you want the most natural looking blush on the planet, then this is the one for you. It sheers out beautifully and seems impossible to get wrong. One of my favourite products from Latest In Beauty's Hip & Healthy Summer Glow Box was this incredible self tanner for the face. I've always struggled to find a decent product for the job as many left me looking too orange or dark, but this is absolutely spot on for me. A lovely oil-free gel serum primer that preps the skin for foundation and has the added bonus of SPF 20 too. As it's silicone based, I use it sparingly (a little goes a long way with it anyhow) but it does such a great job of keeping foundation in place, making the skin look more revived and so far I haven't had any breakout issues after using it for a month. The skinny tube also doesn't take up much space in my makeup bag so it's a handy extra to have in there. 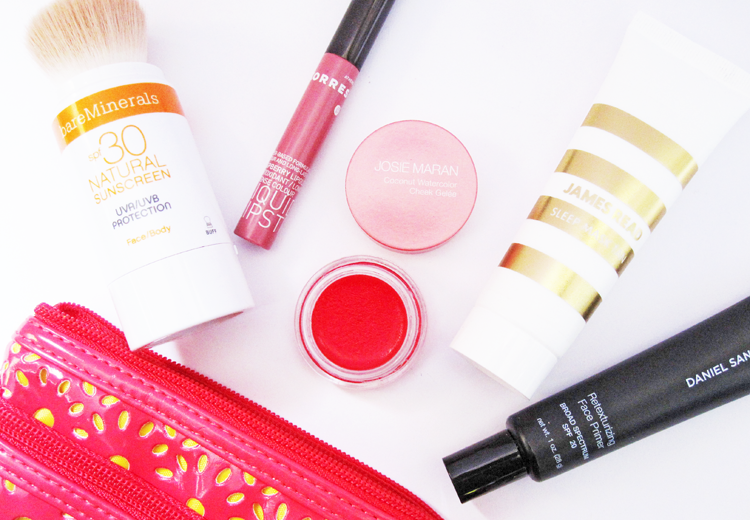 What's new in your makeup bag? P.S Have you entered my international Giveaway to win a Daniel Sandler Watercolour Blush of your choice? Click here! The Josie Maran cheek gelees are life! Question: what kind of foundation are you using? I usually use primer with liquid or cream consistencies, but that BM sunscreen is a powder so I'm wondering if they layer well. They are amazing, I want more! I have to go try out a liquid lipstick. I almost picked one up the other day. This looks gorgeous. I don't think I've heard of a brush-on mineral sunscreen before, how genius?! It's very innovative isn't it?